Here at WCSA, we are yet again really looking in classrooms to see what goes on day in day out. A big part of this is talking to you - the parents – as well as using “student voice” in school. I really enjoyed our Parent Forum before Christmas. I know that we will be doing a follow up in Term 3. As always, please do contact me if you would like to be part of this. As a parent myself, I know that you rely on your children to tell you about their day at school. My son is in primary school and I still get chapter and verse about who said and did what and who was whose talk partner! I am led to believe that this willingness to talk diminishes as children get older? So, in case you are wondering what goes on in classrooms, please read on (better still, please book in with me for a tour and I would be delighted to show you). · What are you learning? · Why are you learning this? · Where does it fit in? All teachers use basic overviews (pictured below) to set up learning objective led lessons. 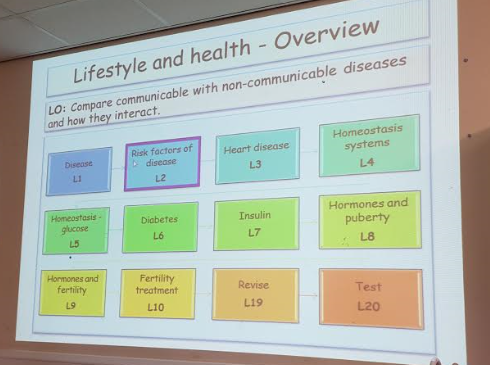 As part of the learning objective students can chose which level they work at (you will recognise this colour coding from the reports you get home). Once the lesson is underway, we want students to know how they are doing and to be able to identify any gaps in their learning. All faculties use some kind of review sheet to help students do this. When your children are coming up to GCSEs, this is really useful as it forms the basis for what to revise. Pictured below is a RAG sheet that students have been using in Science. Now, unless you have children sitting GCSEs (or have had older siblings go through the system) you will probably still not be entirely sure about the new 9 – 1 grading system. We talk about this a lot. The Grade 9 is slightly higher than the old A* - so not an easy grade to get. A grade 4 is equivalent to the old C grade, with a Grade 5 being considered a higher C grade. – toward B. We make this as clear as we can for students, so that they can aim for the appropriate grades. Below is an example from a GCSE History lesson. So – please do get involved in our school. E-mail me if you would like to be part of a Parent Voice group. Book in for a tour of the school. Or – simply keep supporting your children at home as I know you do so well.